Oh, I say old bean, pip pip, cheerio, what what? 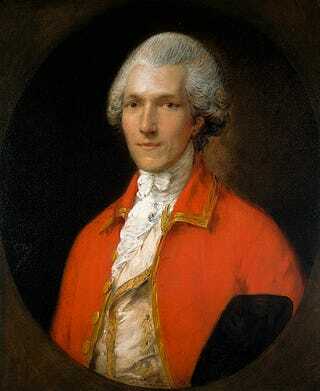 Hmmm....powdered wig, red coat, supercilious expression....must be English. His name is Benjamin Thompson. Or, I should say, was, seeing as how he died in 1814. While I'm fairly sure none of you have heard of Benjamin Thompson, his title might be slightly more familiar to some of you; Count Von Rumford of the Holy Roman Empire. Never heard of him? Have you ever heard of the Rumford Range? Rumfords Soup? Thermodynamics? Long underwear? Wait wait wait....I'm getting ahead of myself. Allow me to introduce you to a very interesting man; Benjamin Thompson. Benny was born in the colony of Massachusetts in 1753. He appeared at first to be a simple country boy. However, he proved to be the brightest student in his small school. By the time he was 13, he was known to walk to Harvard to listen to lectures. He was apprenticed to a well connected merchant in Salem, and as a result, he met and associated with many influential people, including many of the colonies greatest scientists. And, Benny was a quick study. Although he was a quick learner, and fairly bright by the days standards, he lacked a formal education. That meant his prospects for the future weren't good. He'd most likely end up as a shop keeper. And that didn't please Benny. But in 1772, he met a rich widow who just so happened to have a lot of land in New Hampshire, near the town of Concord, called Rumford. Ben was a charmer. (and quite a bit younger than the widow), and he was able to secure her favors, and they were married. By the time the revolution started, Ben was a wealthy land owner in New England. So, he of course, became a loyalists. It was, after all, the British who kept him rich. So he became active in recruiting men to fight with the British. This really pissed off his neighbors. So one night, a mob showed up at his front door with buckets of tar and sacks of feathers. Prudence being the better part of valor, Benny ran away faster than Brave Sir Robin*. He escaped to the British lines, where he was made an officer in the loyalist forces. He wasn't a really good leader, but he was a good advisor. He advised General Gage. He also did some work on making gunpowder more efficient. That work made it's way back to England, so by the time the war was over and he fled to England, he was already known in the scientific community. In fact, being on the losing side was about the best thing that could have happened to Benny. While in England, he began to associate with many well known luminaries in the scientific world. He moved several times and conducted ground breaking work on thermodynamics. Work that wouldn't be equalled until the work of Lord Kelvin. While in Bavaria, he created a low-cost, high-nutrition soup to be fed to inmates in prison. It was so successful that European armies used a variation of it for the next hundred years, or so. He developed a more efficient stove, the Rumford Range, that is still in use in places today. He improved the chimney, allowing for more efficient heating and better smoke removal. He even invented thermal underwear. With his friend, Sir Joseph Banks, he created the Royal Institute, and they recruited Sir Humphrey Davie to be their first lecturer. Rumfords assistant, Michael Faraday, made the institute a world class research institute, and started a series of lectures designed to popularize science. The Royal Institute still has popular lectures broadcast on TV. Along the way, he was knighted in England, and was named the Count Von Rumford of the Holy Roman Empire, He endowed chairs at Cambridge and Harvard. There is a crater on the moon named after him. Also some Balking Powder. Benny died in 1814. His final resting place is a small cemetery in Paris. So far, Ben seems like a bright fellow, who accomplished much in his life. But the one thing I haven't mentioned yet is the one thing people have been seeing a lot of this year. And it's the subject of todays Made Up Monday. As we've seen, Ben was an active man. He spent his free time theorizing, and inventing. One of the things he invented during the winter of 1773/74 was something we take for granted today. The snow plow. It wasn't the kind of plow you'd imagine, like the ones we have today. And, he wasn't the actual first person to come up with a type of plow. What he did invent was, an incredibly more efficient version that allowed, for the first time, roads to be cleared from town to town in a relatively short period of time. His invention was actually a long, low slung, four wheeled cart that had a large piece of wood set at an angle under the center of the chassis. It looked much like todays road graters. It was designed to carry weights over the blade to ensure a good scrape. The standard team of horses to pull it was four but teams up to eight could pull it if the snow was especially deep or heavy. He named his invention the Snow Plough. He called it a plough because it did the same thing as a traditional plow, it moved the unneeded material to the side. Rumford made a small profit from his invention, but before he could really market it and reap the rewards, the revolution broke out, and as we have seen, he was on the wrong side. Now my friends, riddle me this, Did Rumford build his Snow Plough, or am I full of crap? You tell me. I'll supply the answer tomorrow. *Yes, that is a Monty Python and the Holy Grail reference. Slowly boil until thick. Serve with bread. If this is to be your primary source of food, supplement the soup with corn and herring to provide vitamins C and D.